Last fall, I couldn't find my passport. And it was really eating at me, because it was expired and I wanted to get a new one, and get one for the girlie. You know, just in case we need to flee the country or something. Eventually it turned up, but then I started wondering where my social security card was, since those kinds of documents usually stick together. I knew I had one - the original one that I'd gotten in high school - but it was nowhere to be found. I've spent most of the past two weeks away from home, mostly at my mother's house. In between bouts of incompetent nursing, my sister and I engaged in some aimless archeology (and surreptitious updating of one another's Facebook statuses). Lo and behold, in a box of random treasures, I found my social security card. It was in one of those plastic card/photo holders that slips into a wallet, though the wallet is no longer around. The only other thing in the photo holder was the only picture of a family member that I can ever remember having carried around with me. These days, I've a handful of pictures of the girlie on my phone, and a couple tacked up around my desk, but I've never been the sentimental type that carries photos. I have no idea when this picture was taken, or where. I don't recognize the house. But it's my mother. I love the ginchy hands, and the way she looks so happy under her Groucho glasses and the family wig. When I slipped the picture out of its sleeve, it delaminated. It's an old Polaroid, and it had been cut to fit in the sleeve. I quickly (and crookedly) scanned it and stuck it back in the sleeve. You can see how the surface layer is cracked - from age, from being sat upon. It's a thoroughly goofy photo, and it was good to find it. Because the woman in the photo is now but a shell of herself - her fingers are gnarled, her smile is rare, her plastic nose has been replaced by an oxygen tube. But she once was. ...and will always be in your memories and in your heart. What a great picture. her hands and fingers are marvelous! 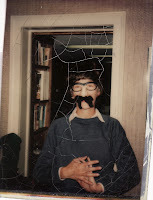 so is her willingness to pose with the wig and the groucho glasses. what a lovely find! She does have very strong hands in that picture, doesn't she? My heart did a little flip when I realized that was your mother. It's an incredible shot, and I loved your post. I bet she was a lot of fun when she was younger! Did you show M? I love that photo. I think it was taken at the Levines' original house, the one at the curve in North Plandome Road. Ask Susan if the backdrop looks familiar. Oh, Maggie. What a treasure. By the way, you can apply for a renewed Passport with a lost one. I had to do it once. Good things find us when we need them most. What a wonderful, wonderful surprise. I love the serendipity of it all. Why were one-off photos so good in the old days, before digital cameras? I have to take 20 to get one decent one now. I, too, love those hands. Beautiful. I miss polaroids - that instant photo! Digital just isn't the same. Glad you were able to save this one. Oh my god, devine by every measure. I'm so glad that you found that picture, Magpie. What an amazing photo, amazing mother, amazing daughters. You're so much in my thoughts as you spend this time with her, moving between your memories, which must be swirling around so much as you sit with her, and your present. This is wonderful. The post, and the photo. What a treasure you found! And you were so lucky to be able to salvage it. What a great story...thanks for sharing. I, too, don't carry photos. I think about it, but it just doesn't happen. Wow, the Groucho mustache and fake nose thing was big in our folks' era, eh? What a coincidence! I'm really glad you sent me to this post--glad, always, to read more of you. That last sentence or two are awfully heart tugging.